We are here to help you today to achieve your business potential and thrive. Gecko Programmes Ltd was established in Wolverhampton in 2009. Initially, we were established to provide business services to the creative and voluntary sector in the Midlands, supporting them to develop and fund new projects. Now we are working across many sectors, adding sports and leisure, hospitality, tourism, retail and other services. We are proud that we delivered a Future Jobs Fund contract in the Black Country and Birmingham, creating 225 jobs for young people and launching their careers. We have come to hold Skills Funding Agency contracts to develop skills in these sectors, with leaders, employees and new-entrants, and to hold DWP contracts to mentor jobless people into employment. This has led to become approved suppliers to the Social Investment Business, providing business development support for periods of transition. ​Hence we create and deliver programmes that develop organisations, skills and people. We add value to UK training by offering the opportunity for work placements in the EU, now leading a consortium of six colleges: City of Wolverhampton, Walsall, Dudley, Birmingham Metropolitan, Solihull and South and City College Birmingham. Since 2010 we have been working with European partners to develop new and innovative curricula. Our successes have been to develop a vocational training manual for cultural event managers, a toolkit to implement mentoring programmes into the hospitality sector, workshops to develop enterprise skills in artisans, and learner materials to instil enterprise skills in young people. 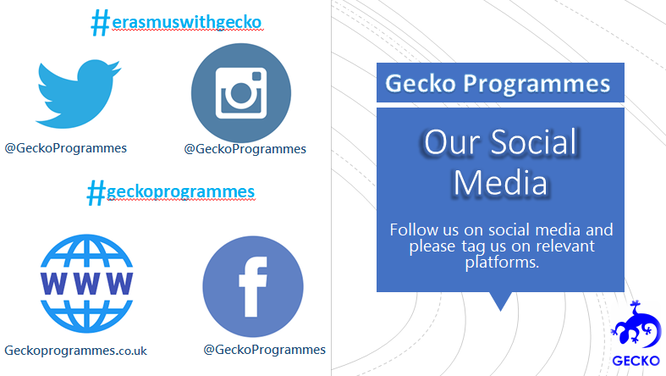 More of these projects and partners can be found on www.geckoprogrammes.eu, our European website.